Have a go, you mug. To me, ‘having a go’ is about being true to who you are, saying things the way you see them, being bold, blunt sometimes (telling the truth), shaking it up. In our business culture, though, this can be fatal. Particularly if like me you don’t always have the smarts, tact or emotional intelligence to control yourself at key moments. 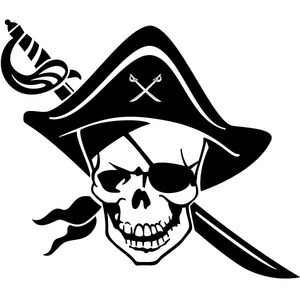 Be a friendly pirate, who breaks the rules a little and ruffles feathers, who is loved by some and disliked by others (but is rarely just ‘liked’), who stirs emotions, who sometimes falls flat on his or her face, but always picks themselves up, and laughs into the wind, thumbing their noses at the cleanskins. Friendly pirates though always add value, and inspire. They do the right thing, but march to their own drumbeat. Yes, these types sometimes miss out from the power and the glory, but they never miss out from the exhileration and self-respect that comes from being themselves, from taking risk, through embracing boldness, uncertainty and chutzpah. A poker player I am not. My emotions and a touch of mischief let me down. Maybe it’s because I don’t ever want to be described as the kind of person epitomised by Paul Keatings’s description of John Hewson: ‘He probably gets out of the shower to do a wee.’ Squeaky clean. Prim and proper. I’d much rather have been General Paton than Eisenhower. Yes- I know. Crazy! Eisenhower was a giant, who did giant-like things. Be yourself. Be true to who you are. Be a disrupter, in a positive way. Help create the right momentum. Strive for action. Break a few rules. Don’t be a hothead, or let arrogance deplete your impact – as I have on occasion. Do be prepared to stir it up – even if you get slapped for it from time to time. My favourite author is but vaguely remembered today. W. Somerset Maugham. In his time, the most popular writer in the world. Yet he was a realist, describing his talent: ‘I am firmly in the front row of the second division.’ That’s how I feel about my own little career – in my little world. I could have been that pirate, but done it so very much more effectively. Yes – I know there’s still time to kick a bigger goal, but my ambition has moved on. ‘Have a go, you mug.’ Do it well, and you will end up having that sunset drink (when you decide it’s sunset time) with complete knowledge that you ‘turned up’. Possumites. Ask yourselves: are you shaking it up, challenging and disrupting, in small ways in whatever it is you do? Are you telling the truth? I hope so. Please- just do it with intelligence and tact. Do that, and you’ll end up in the front row of the Premier League! (Go the Hammers!). I don’t expect you all to agree, by the way. In fact, I hope many of you don’t. That’s my point, I guess. Stirring emotions and debate. Cleanskins avoid it. Pirates thrive in it. Come on now!!! Have a go, you mug! Good discussion Chris, whatever side of the fence you sit. There are leadership types for all seasons; trait, functional, transformational, servant, HRO, narcissistic, amorphous. Some are gregarious and charismatic, others are quiet achievers. Then you have the level 5 leaders that blend many of these traits. I think the crux is to observe the leadership style you admire (from choices like Branson, Musk, Trump, Rudd, Ghandi, Hitler, Chrurchill), that suits your industry and personality then do your best to go mimic it. I knew there was a reason why I kept that black patch in my top drawer. Thanks for the reminder to speak the truth, especially to power. Yeah thanks Chris, this is what i needed to hear! Feel the fear and do it anyway lol. Sorry to do this Chris but I have to agree with you. Great words and the fire up I needed! High seas all the way. Great post as always Chris. A timely reminder to speak up and challenge v’s step back and maintain the status quo. Nothing great was ever created that way. From one pirate to another! Thanks! Very pertinent mate, given our email exchange last week! Was it that which prompted this blog? 🙂 Speak soon buddy. Im reminded too that I often feel I have not done enough when I see what others do. Then I remember how much I have been blessed with compared to most. Once again a great insight. I always loved it when you poked us while you were leading STW!